Smart and beautiful: two qualities consumers can't get enough of in their gadgets. Fashion brand Fossil has picked up on this trend and aims to deliver on consumers' desires with its newest smartwatch, the Q Marshal. 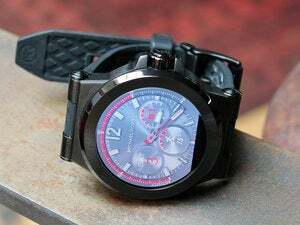 At first glance, you may mistake the Q Marshal for a conventional watch, a feature that seems now to be the aim of many smartwatch makers. The watch comes in a variety of bands including leather, stainless steel, and silicon. I tried it on for myself at IFA in Berlin, and it felt comfortable. The face and band were a little bit too big for my wrist, but the circular display was attractive. Unlike some other smart watches, the Q Marshal features an always-on display, which Fossil says gives the Q Marshal a battery life of about 24 hours, depending on use. The Q Marshal is powered by Android Wear, but the watch is also compatible with iOS as long as users have the Android Wear app downloaded on their iPhone. Its features are ones we've come to expect from all smart watches and include activity tracking, music control, and notification alerts. In terms of design, the Q Marshal's heavy, circular build is reminiscent of Samsung's Gear S3, which I also had a chance to try on. Unlike the Q Marshal, the Gear S3 did not have that awkward little zone in the bottom of the circular watch face meant to house the watch's sensors. Both watches also have a built-in speaker that allows users to answer calls straight on their watch, though of course, the phone still needs to be close by for this feature to work. Fossil's Q Marshal smartwatch has a small black area on the bottom of the display to house the watch's sensors. The Samsung Gear S3 on display at IFA in Berlin on Sept. 2, 2016. Fossil's Q Marshal is available now and ranges in price from US$295 to $315 depending on the style of band you choose.